1 of 6 Heat oven to 400 degrees F. Coat a 15-1/2 x 10-1/2 x 1-inch jelly roll pan with nonstick cooking spray. 2 of 6 Blend flour and salt. Cut in butter with pastry blender until mixture resembles coarse crumbs. Add peanut butter; quickly work into mixture. Stir in sugar, egg and egg yolk. Add peanuts; mix well. Divide dough in half; form into 2 discs. 3 of 6 Press half of the dough evenly into bottom and up sides of prepared pan. Bake at 400 degrees F for 15 minutes. 4 of 6 Roll remaining dough between 2 sheets of parchment or waxed paper to a 1/4-inch thickness. Put on a baking sheet; freeze for 15 minutes. 5 of 6 Reduce oven temperature to 350 degrees F. Spread jam over baked dough. Remove top piece of paper from chilled dough. Cut into 1 inch strips. 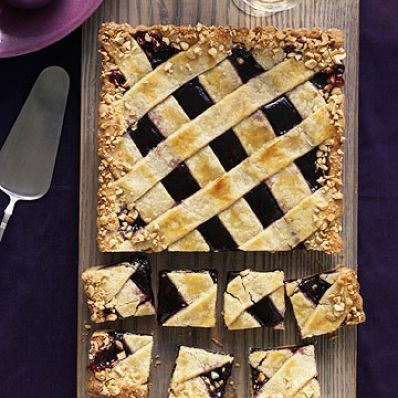 Arrange in lattice pattern atop jam. Press ends of strips to edge. 6 of 6 Brush egg wash over pastry. Sprinkle nuts around edge. Bake at 350 degrees F for 35 minutes. Cool on rack.